With a new date set for Samsung and Google to unveil the Galaxy Nexus, people have started to wonder if those rumors of it being a Verizon exclusive for a few initial weeks were true or not. While our sources have led us to believe that, we will probably know for sure come Tuesday. 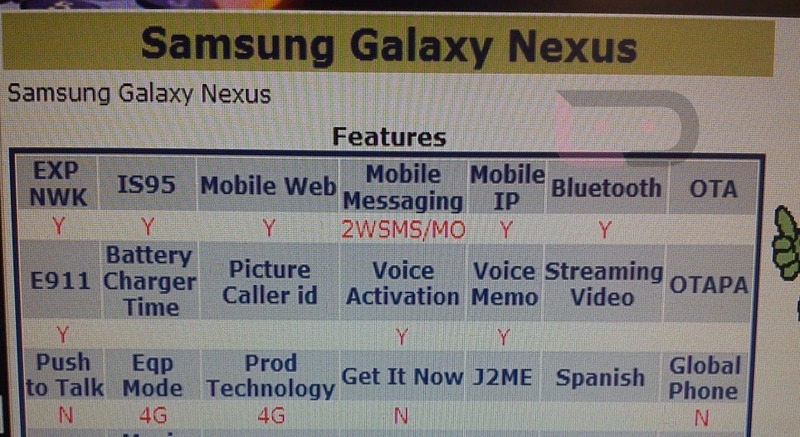 With that said, the fact that the device is now in VZW’s Device Management system as the “Samsung Galaxy Nexus” is a good sign that it is most definitely coming to Big Red under that name – something that a growing number have conitnued to question. What else are we seeing in this screenshot? That the G-Nex (as mentioned countless times) will have a 4G LTE radio to take advantage of the fastest network in the land. Of course that probably also means that it will live up to the rumors that it has similar battery life to the rest of the Verizon LTE devices, which has not necessarily been a compliment this year. It is also showing as “N” for “No” in the global department. That could frustrate some, especially given the fact that the GSM version will likely be able to travel the globe. Good signs for an imminent release though. Now, how about an FCC filing?